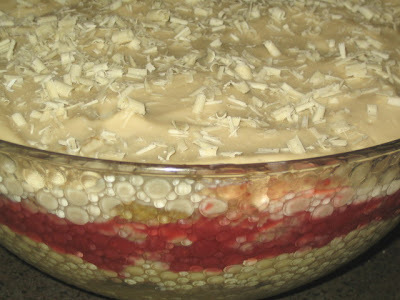 Anyone remember having trifle in their pre-vegan days? I sure do, it was a Christmas dessert tradition in our house, and so this year I recreated the tradition for our family, vegan style! The trifle was far easier than I had anticipated. Once the elements for the layers were prepared (which could be done a day or two in advance), then it was merely a matter of layering... and then the hardest part - waiting! Made the cake layers (used the All-Purpose Vanilla Cake recipe from ed&bv), custard, pineapple sauce, strawberry sauce, and Celestial Cream (also from ed&bv) ahead of time, and refrigerated everything until cool. I assembled the trifle on Christmas Eve, but next time I'll assemble the morning before serving (if serving for afternoon or evening). A day in advance made the layers soak into one another more than I had wanted, though it tasted terrific nonetheless. Then, more cake/custard, and a grating of white chocolate. I used an Organica White Chocolate Bar and really liked its flavor, and also appreciated that it is made with great ingredients including organic fair-trade cocoa butter, fair trade organic raw cane sugar, and organic rice syrup. More cake (here you see my elves helping out), and then finally the layers were topped off with the Celestial Cream, and shavings of more of the white chocolate. Dreena, that looks so delicious! I love all the colors and the flavor combinations sounds heavenly! YUM! I have never had a trifle. I only heard about it when Rachel on Friends made it and used meat in it by accident when the page was missing in the cookbook...lol! 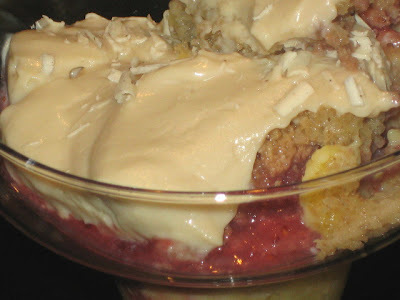 Interesting that trifle isn't so commonly known... it was very popular in our area growing up - and still is - though most versions are heavily soaked with booze! Lauren, I missed that episode - that's funny! I've never had vegan or non-vegan trifle, but when I was in the UK my friends kept telling me to try it, which makes me think it's a british thing. Anyway, can't wait for the whole recipe so I can try it. Which reminds me that I still need to make your tiramisu.. Here's the link to the clip from Friends, in case you wanted to laugh. But the whole episode is really funny! Yummy! What kind of custard recipe do you use, Dreena? oh my goodness, dreena. this looks amazing!! i made a trifle last year for christmas. i baked gingerbread and layered it with lemon cream, blackberry sauce, and blackberries. it was insanely delicious. i love all the flavor combinations in this. your tastebuds must've been in heaven!! My omni family's more traditional when it comes to meals/desserts, but next christmas/holiday I'll have to surpise- or not mention- that such a fabuloous dessert is vegan. Why is it that so many "outsiders" cringe and immetietly dislike the word/idea of "vegan"? They just don't understand... It reminds me of a multi-layered bread pudding! =)Perfect for my vegen daughter's sweet tooth on special occasions... on maybe sooner! I have had Trifle every Christmas as the dessert.... this past year, I skipped it... now I don't have to! Thank you Dreena!! I've never before heard of a trifle dessert, but that is the most decadent dish of yumminess I have ever seen! All the layers have me going crazy! I also missed the trifle badly but finally with various things available nowadays I can make a very passable one (especially if I add a good sweet sherry to the cake LOL). Now if only I could get Celestial Cream here as the coconut cream I used overpowered the trifle a bit. hiya Aimee, yes, I forgot to mention that. I used Bird's Custard - but reduced the amount of milk required from 2 1/2 cups to 2 cups per batch (I made a double batch). There are other brands of vegan custard available that have 'better' ingredients (ie, Bird's has some coloring)... but in my area this is the only one available, so I used it for this once-a-year dessert (though, with Easter ahead, I'm thinking of repeating this trifle)! Very easy to make this custard, and it sets up great - and tastes so good - reminds me of eating it as a kid!! Joanna, THAT ingredient combination you put in your trifle sounds fantastically delicious!! Hi Jackie, the Celestial Cream is actually one of my recipes - and you can find it in my recipes page link, with the Raspberry Cornmeal Pancakes... enjoy!! So I opened my current issue of Alive magazine this evening and there's a recipe for sniffle soup. I thought, "Oh, that's like Dreena's recipe!" And it was! Kudos! By the way, we had the polenta fries for lunch today. Oh my! Yum-o! I think I've overused the exclamation mark in this message! When I was younger, I Just *loved* trifle. My step mum makes it every year, and this year and last year i've had to miss out - because i'm vegan now. Very disappointing. I can't seem to find a good custard, or i'd try to make it myself. eyeofthelens, not sure if you read my comment above to Aimee, but I used Bird's custard in this recipe - and it works very, very well (though I reduce the non-dairy milk to 2 cups per batch rather than 2 1/2 cups). It's a very common custard, so you should be able to find it - I hope you do! Oh yum! 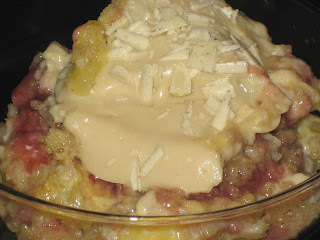 My partner loves trifle, it's a British thing I guess, and I have been told numerous times that I should make him some. I should!